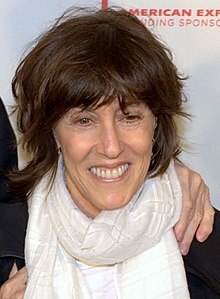 Nora Ephron ( EF-rən; May 19, 1941 – June 26, 2012) was an American journalist, writer, and filmmaker. She is best known for her romantic comedy films and was nominated three times for the Academy Award for Best Writing: for Silkwood (1983), When Harry Met Sally... (1989), and Sleepless in Seattle (1993). She won a BAFTA Award for Best Original Screenplay for When Harry Met Sally.... She sometimes wrote with her sister Delia Ephron. Her last film was Julie & Julia (2009). Her first produced play, Imaginary Friends (2002), was honored as one of the ten best plays of the 2002–03 New York theatre season. When we were working on 'Julie & Julia,' I went back to the Julia Child cookbook and made some things I haven't made in a while, one being beef bourguignon, which to me is a hilariously 1960s dish that everyone felt they had to serve at a dinner party or they weren't a grown-up. I don't have writer's block, really. I do have times when I can't get the lead, and that is the only part of the story which I have serious trouble with. I don't write a word of the article until I have the lead. It just sets the whole tone - the whole point of view.